Federal Student Aid, the part of the U.S. Department of Education that puts out FAFSA (the Free Application for Federal Student Aid), sent out a tweet Tuesday evening that a. people paid attention to and b. they did not enjoy. According to ABC News, the tweet in question included a screenshot of Kristen Wiig in Bridesmaids and prompted some to question its sensitivity. 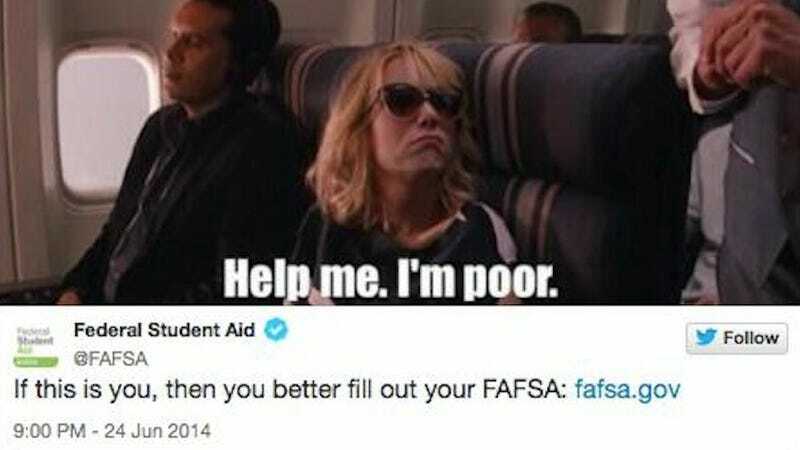 "not everyone who completes a FAFSA is poor and mocking those who are at or below FPL is tasteless, offensive, and ignorant," wrote one person on Twitter. "The contempt for us in the low income brackets is constant, and obvious," wrote another. The tweet was soon deleted and FAFSA apologized. "A lifetime of debt a reality for all," responded one person to their apology. Sometimes it feels like we should just leave being hip and cool to the non-governmental entities. In other FAFSA-related news that has gotten less attention than this but is far more exciting: a group of senators have introduced a new bill that would cut down the many, many pages of the FAFSA application into a document the size of a postcard. It would ask for just two pieces of information: how large the student's family is and how much money that family made in the past two years. "...you can get needy students more aid with a lot less paperwork, and a lot more transparency," wrote two professors in the New York Times about the bill last week. "Evidence indicates that this will make our aid programs much more effective in doing the job they were designed for: getting more people into college."